I'll tell you how I'd like to be remembered: as a black man who won the heavyweight title and who was humorous and who treated everyone right. As a man who never looked down on those who looked up to him and who helped as many of his people as he could–financially and also in their fight for freedom, justice and equality. As a man who wouldn't hurt his people's dignity by doing anything that would embarrass them. As a man who tried to unite his people through the faith of Islam that he found when he listened to the Honorable Elijah Muhammad. And if all that's asking too much, then I guess I'd settle for being remembered only as a great boxing champion who became a preacher and a champion of his people. And I wouldn't even mind if folks forgot how pretty I was. The King of Boxing is the latest in a long list of extraordinary honors bestowed upon three-time Heavyweight Champion Muhammad Ali. "The Greatest of All Times" was crowned at the WBC 50th Convention in Cancun, Mexico as his wife, Lonnie, and hundreds of admirers looked on. President Jose Sulaiman, WBC Champions Vitali Klitschko, Sergio Martinez, Saul "El Canelo" Alvarez and "El Gran Campeon Mexicano" Julio Cesar Chavez helped Ali as he donned the crown and robe. He was also presented with a diamond belt to honor this achievement and his remarkable career. Standing ovations and chants of "Ali, Ali, Ali" followed the presentation and a film that highlighted Ali's stellar career and incredible life. His extraordinary courage was the theme of the evening, a characteristic he continues to embrace, as he made the long trek to Mexico to accept his award in person despite his physical limitations. Acting as Ali's spokesperson, Lonnie said that he was honored to be chosen for many reasons, most especially because it is a first-time award, and Ali is always eager to be first. The audience responded with laughter when Lonnie also remarked that Ali wondered why this award had taken so long. At the end of the evening, Lonnie continued to thank the presenters: "Muhammad is humble, but he is so grateful to be honored in this way, at the age of 70, by all of the boxing world, from the legends and the newcomers, from every division of boxing. To be named King of Boxing is a huge honor for him." 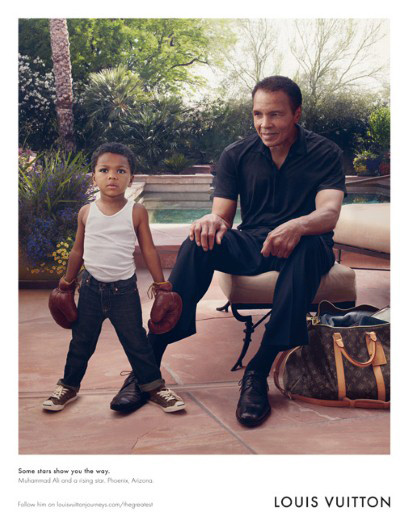 *Muhammad Ali, at age 70, has become the new face of Louis Vuitton's Core Values travel line. The three-time world heavyweight boxing champ appears alongside his grandson at his Arizona home in the campaign, which was shot by famed photographer Annie Leibovitz and appears in the international press beginning Friday (June 15). Louis Vuitton CEO and chairman Yves Carcelle said: "Muhammad Ali is the epitome of an outstanding personality – a true living legend in boxing and far beyond. We are honored that he agreed to be photographed for the Core Values campaign, and delighted with the way this beautiful portrait of the champion and his grandson captures the idea of transmission, which is of great significance to Louis Vuitton." Ali follows in the footsteps of Angelina Jolie, Rolling Stones guitarist Keith Richards and U2 frontman Bono who have all modeled for the label's Core Values travel line.